Jose Mourinho has been pictured talking to Everton defender and one-time Manchester United transfer target Yerry Mina at Old Trafford. The Colombia international hasn’t yet featured for the Toffees since his summer move from Barcelona, which came as something of a surprise as he’d been linked strongly with United prior to rocking up at Goodison Park instead. 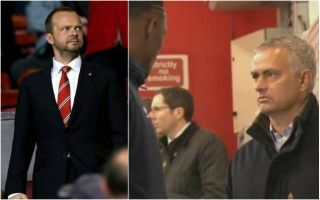 Mourinho could still do with strengthening at the back and the Guardian claim Ed Woodward seems ready to back the Portuguese with £100million to spend in the January transfer window to land his targets in defence. Although Mina has not been mentioned as being among those targets, it wasn’t so long ago that the Sun reported of several key figures at the club being surprised that they missed out on the South American centre-back this summer. It’s not clear what Mourinho and Mina were chatting about as Everton came to Old Trafford this weekend, but it’s fair to say it raised one or two eyebrows after being noticed by ESPN among others. With United looking set to spend big on a defender and Mina not playing at Everton, could this chat with Mourinho mean the Red Devils remain interested in doing a deal this winter?